Here comes my first in-depth logo study focusing on Marvel characters. I haven’t been able to discover the designer on some of the logos, and information about exactly who did what on staff at Marvel in the early days is sketchy, so there are some unknowns. On the other hand, I do have quite a bit of design process information, like logo sketches, for many of the logos, so for those of you who like process info, it’ll be here. These articles will focus on regular X-Men team books, not one-shots, mini-series, crossovers, team-ups, or individual character spinoffs, with a few brief exceptions. The X-Universe has become vast indeed, and I have to draw the line somewhere. Let’s get started! 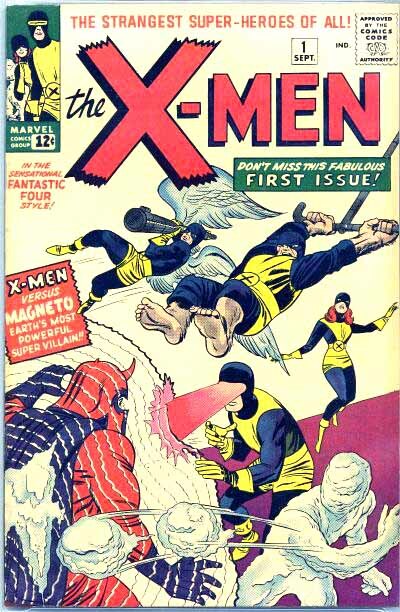 Above is the very first X-Men cover and cover logo from 1963. Stan Lee, who created the characters, has said that publisher Martin Goodman rejected his first name for the book, “The Mutants,” and he named it instead after the X-factor gene that, in the stories, causes humans to mutate into super-powered beings after puberty. There is also the group leader and founder, Professor Charles Xavier that some feel the X-Men are named for. In any case, the name has been a great gift to logo designers ever since. First, it’s short. I think the ideal length for a good comics logo is one word from three to eight letters. One and two letter names tend to read as some kind of abbreviation or symbol rather than a title. Longer names can certainly work, but short ones can be larger and have more impact. In addition, the prominent letter here is X, a graphically dynamic letter made of two crossed diagonals that, by its very nature, is going to stand out on any magazine cover, where the frame and other type and titles are usually rectangular, vertical and horizontal, or circular. X is also a letter rarely used at the beginning of words, so it stands out that way too. And by calling the book X-Men, separating the X with a hyphen, it gives even more emphasis to the X, encouraging a logo designer to make it bigger than the rest, as this first one is. Note that “the” is in front of the X, quite small and in script, giving full prominence to the X, where it should be. And the X is made even more dynamic by ending the strokes in a row of jagged points like a stylized brush-stroke. The hyphen and MEN are standard block letters, again putting the focus on the X. Finally, a lower left drop shadow gives the letters a little rise off the page and a better chance to stand out from any artwork behind them. Sol Brodsky told me that he designed all the early logos…and that was Stan’s memory, too. The final renderings of most if not all of them were by Artie Simek, however. Certainly, FANTASTIC FOUR, THOR, SPIDER-MAN, X-MEN, AVENGERS, DAREDEVIL, SGT. FURY and HULK are all Simek finishes. Sol Brodsky was Stan Lee’s right-hand man and production manager in the early days of Marvel Comics. In pre-Marvel days, Stan and Sol were the entire staff of what was then Atlas Comics, and Sol did virtually all the production work, as well as some pencilling, inking and other creative tasks, in Marvel’s early days. Artie Simek was the main letterer for the company, and did much of the cover lettering as well, most probably including the remaining titles on this cover. In this case, the “design” that Brodsky did was probably laying out the logo in pencil, and Simek inked it. He may also have added the ragged edge to the ends of the X.
Sol Brodsky, who was Stan’s production manager back to the early ’50s, was likely the sketch-designer of at least some of the first-generation Marvel logos. I should mention that Sol is the guy who hired me in the first place, and my affection and respect for the guy is undying. During the poorest times at Atlas, roughly ’53-’57, he and Stan ran the place, just the two of them. He inked his own solid pencils on many suspense and teen humor stories in those days, while managing production for the dozen or so titles. Having said that, as a jack of all trades he was not the most accomplished lettering draftsman, and that’s the standard I’m following here. The majority of the early Marvel logos are very straightforward, but there are telling bits and pieces. For fear of sounding hypercritical, these are my indicators as to whether Sol rendered them, or whether they’d been finished by Artie Simek, who began with Stan around the same time, and had a more studied approach. The uneven proportions on “the X-Men,” and particularly the introductory “the,” suggest to me that Sol did this one. Tom also mentions Simek’s “trademark ragged-edge letters,” such as those on the X here. So, I think a team effort between the two is the best guess. To my eye, the original X-Men logo seems a bit clunky, not as polished as the logos usually produced at DC Comics by Ira Schnapp. The word “the” is quite uneven, and shouldn’t it begin with a capital T? On the other hand, the logo and the cover art by Jack Kirby have lots of raw energy, something I found very appealing as a kid. Like many others, I was drawn instantly to the early Marvel covers by that energy, and quickly became a Marvel fan once I read the stories. So, obviously, it did the job of any comics logo: help sell the comic. Note also the belt symbol on the character costumes: an X surrounded by a circle. That would come into play in future logos for the X-books. The book continued with the original logo for several years, not the most successful of Marvel books, but a solid second-stringer. The art by Kirby was gradually passed off to other artists like Werner Roth and Don Heck who could imitate the Kirby style to some extent, and likewise the writing was passed off to Roy Thomas and others, as Stan’s workload increased and he focused on other features. 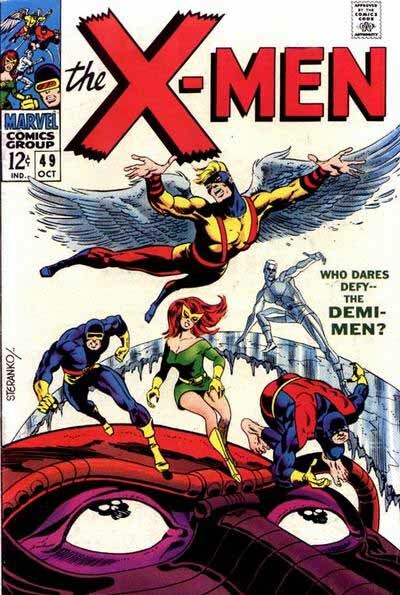 Finally, with issue 49, a new artist, Jim Steranko, produced an X-Men cover. Steranko was of a younger generation than most of the then-current Marvel artists, and while his style obviously owed a lot to Jack Kirby, he brought an excellent design ability to his work that outshone much of what the company had produced up to then. His work on this cover is a bit stilted, with some odd character poses, and I can’t help feeling that the big head at the bottom is looking up at the logo with disgust. Steranko must have hated it, because for his next cover, he designed a new one. And what a great design it was! And boy, have they used it! Steranko’s design, sometimes modified, but clearly still his, has been in nearly constant use by the company ever since. What a shame that he was never paid at least something for it. I know there’s been a lot of bad blood between Steranko and Marvel, and this surely must add to that. Let’s look at the logo from a design standpoint. The letters are tall, block style, with MEN being in much the same shape as the original, with the X now matching. The letters lean left and with perspective putting the lower left corner of the X in the front, the upper edges in the back. Telescoping has been added, and the logo is now very three-dimensional with three-point perspective. Even the letter X itself is strongly in perspective, with the bottom left corner much wider than the upper right corner. Steranko knew perspective, and made it work perfectly here. The letters are separated just enough that a different color on the telescoping makes them very strong and readable, and the overall effect is both more modern and more classically designed than the previous effort. Really fine work! Still highlights the X, but in a more unified way. Steranko only did three covers, issues 49-51, and interior art for issues 50-51, then moved on to other things. But his design influence on the logo continues to be strong today, almost 40 years later. A great tribute to a top design talent, and one that has not been appreciated enough in my opinion. Next, the X-Men fall on hard times. More then! This entry was posted in Logo Studies on October 1, 2007 by Todd. WOW! I had no idea that the legendary Steranko did that logo–one that has reverberated throughout the comics world I’ve known. I have to say, I would never have noticed the little “the” in the first logo, nor its second-place finish to the elegant work of Ira Schnapp, if you hadn’t pointed it out. These logo studies are flat-out amazing. Really enjoying your Logo studies and I was wondering when you’d move on to some Marvel logos. Looks like I have my answer now…very informative and full of unknown tidbits about the creators and the process of making an eye-catching logo. Keep it up! Thanks, Pat, I plan to! Ahhhh, what can I say, these studies just make my day. I never knew that logo was Steranko either, it’s just the classic X-Men masthead – what a shame Marvel tweaked the proportions down with issue 60, apparently to make way for a strapline. Hi, I’m trying to recreat the X inside the circle as fan art. I’m lost regarding the thickness of the circle and of the X. Do you have any info that can help me with that? 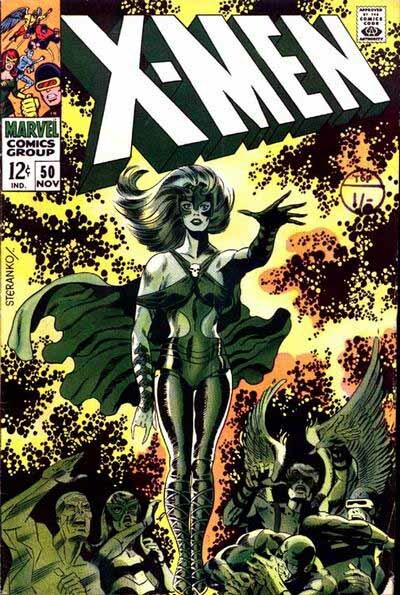 I had the pleasure of meeting Mr. Steranko at a con last year and X-men 49 was sadly the only work of his I could find in my collection (I need to work on that). He of course told me the story about the logo, which made me a little embarrassed that I had brought the “terrible” logo instead of the one he created. He never implied that he asked for payment, though he was clearly disgusted that they never did pay him for something they used for so long. I have to say that he does relish in telling the story, so I wouldn’t call it a total loss (though I’m sure he’d rather have had the money). What a personality that guy has! One of my all time favorite comic creator encounters.